August 14, 2013 - Building on the success of the previous releases over the course of the past year, the Borneo Orangutan Survival (BOS) Foundation is getting ready to release more orangutans from Nyaru Menteng. These rehabilitated orangutans will soon depart from the Central Kalimantan facility to pre-selected release points in Bukit Batikap Conservation Forest where they will be released and monitored by support staff on the ground. These releases are only possible because of supporters like YOU! Please help! 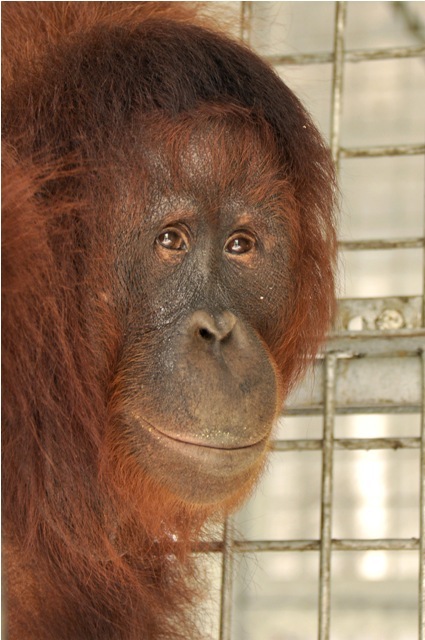 Click here to learn more about Orangutan Outreach's BOS Nyaru Menteng Release Fund! 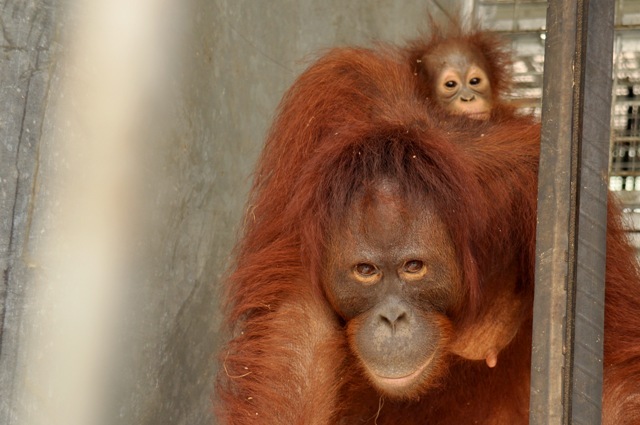 Please make a tax-deductible contribution to BOS Nyaru Menteng today! Thank You for your support! Arun was only 3 years old when he was confiscated from a resident of Banjarmasin, South Kalimantan on December 21, 2002. A rescue team from the BOS Foundation and the Central Kalimantan Conservation and Natural Resources Authority delivered this orangutan to Nyaru Menteng to receive proper treatment and rehabilitation. After 10 years in Nyaru Menteng, Arun is now 13 years old and weighs 55 kg. His cheekpads have started grow. He is handsome and active and his behaviour indicates his potential to become a dominant male. 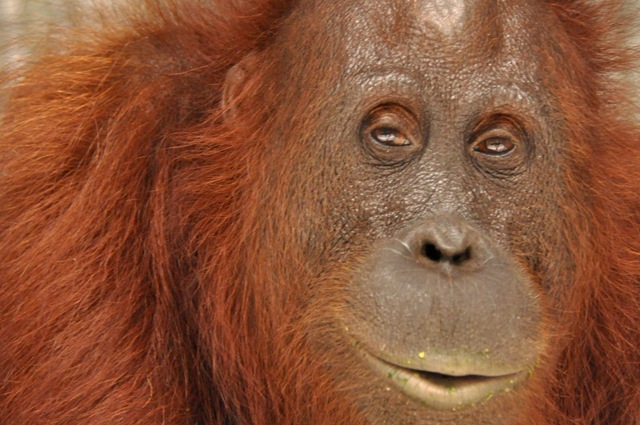 Lulu is a female orangutan who was sent back to Central Kalimantan after being confiscated from her keeper in Jakarta. She arrived at Nyaru Menteng on June 12 2002 in healthy condition and was estimated to be 4-4.5 years old, weighing 17 kg. Lulu is now 15 years old, weighing 37 kg. On Bangamat Island, one of Nyaru Menteng's pre­-release islands, she loves to explore and prefers to be alone. Lulu once ran away and crossed a shallow part of the river using a floating log. After an eight-day search, Lulu was finally found. June 12 2002 Ubai was also confiscated from a resident in Jakarta who was suspected to have acquired her from an illegal pet market. She was then transferred to Nyaru Menteng. She was approxi­mately 4 ­to 4.5 years old and weighed 17 kg. Now at 15 years old, weighing 45.5 kg, Ubai is a tomboy who looks like a male with her long beard, dark facial skin and tough expression. At first glance, she appears to be quiet but she is actually a dominant female on Kaja Island, the pre-release island where she lived. 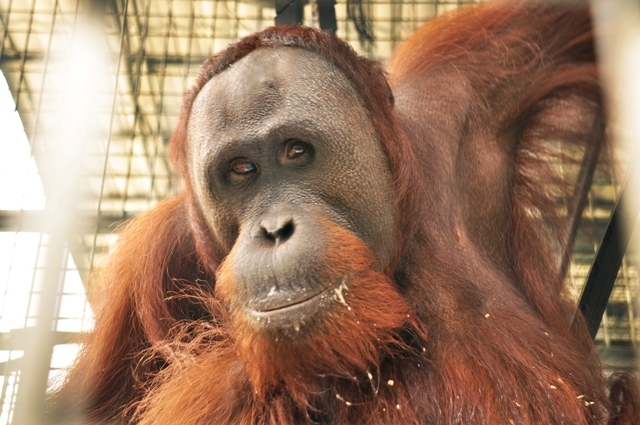 Bonet was estimated to be only 2.5 – 3 years old when he was confiscated from a resident of Pontianak, West Kalimantan. He was then transferred to Nyaru Menteng on May 21 2002. Bonet who is now 13 years old and weighs 46.6 kg really loves exploring. The handsome orangutan with slightly slanted eyes and light brown hair has also started trying to catch female orangutans’ attention on Kaja Island. Lone Droscher Nielsen received a call from a local zoo in Pontianak, West Kalimantan, that a female orangutan and her infant of Central Kalimantan origin, Mama Mozzy and Mozzy, needed immediate intensive care. With the West Kalimantan Conservation and Natural Resources Authority, Lone took them to Nyaru Menteng. Unfortunately little Mozzy passed away two months later due to a heart defect. Fortunately, on April 3, 2010 Mama Mozzy was blessed with another baby, born on the pre-release island of Kaja. The female orangutan baby was named Myzo. Myzo is now 2 years old. 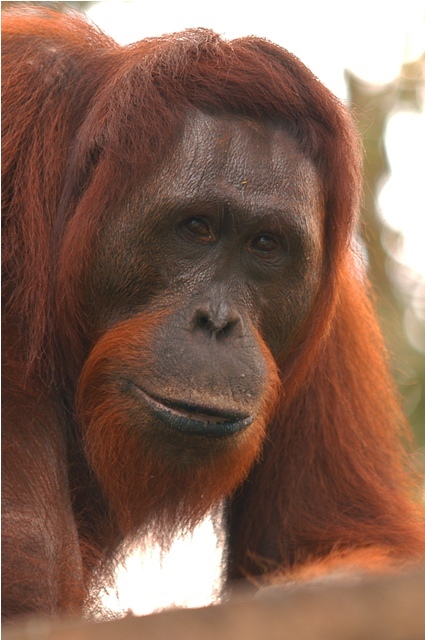 Now 22 years old and weighing 33.7 kg, Mama Mozzy is an active and dominant orangutan compared to other females. The orangutan with a bump on her forehead also loves to explore. In dry season she was often seen strolling along the sandy riverbank. Mama Mozzy loves her daughter Myzo very dearly. She hugs her tightly to protect her when she feels threatened. Confiscated from a villager in Petak Bahandang, Katingan Regency, on December 1, 2002, a young male orangutan of approximately 6 – 6.5 years old arrived at Nyaru Menteng. He was named “Bule”, which means foreigner or person from overseas, for his light-colored hair. Bule is now 17 years old, weighing 73 kg. As he grew older, Bule’s hair turned dark brown, long, and thick making him a very handsome young man. 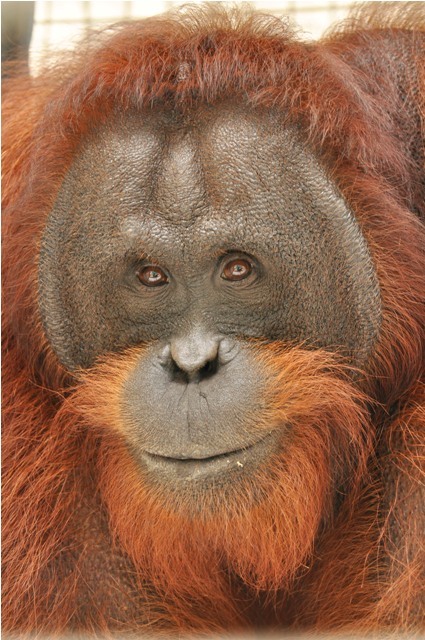 Despite his adorable always-curious expression, Bule is a dominant adult male orangutan. 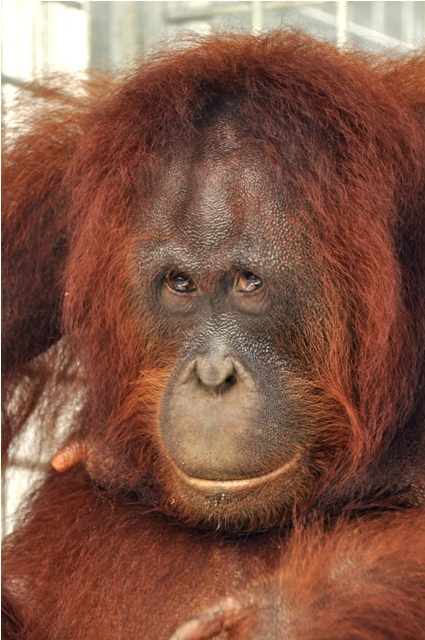 A male orangutan named Max was estimated to be 3-3.5 years old. He was sent from Jakarta to Central Kalimantan to be rehabilitated in Nyaru Menteng where he joined the Forest School to learn his forest skills. Now Max is 15 years old and weighs 55.6 kg. His handsome face is framed with thin brownish red hair on his temple, beard and growing cheekpads. He an active teenager who no longer likes being approached by humans. A male orangutan was confiscated in Palangka Raya by the Central Kalimantan Conservation and Natural Resources Authority and sent to Nyaru Menteng. Uban, the orangutan, was estimated to be 3 – 3.5 years of age and weighed 10.5 kg. 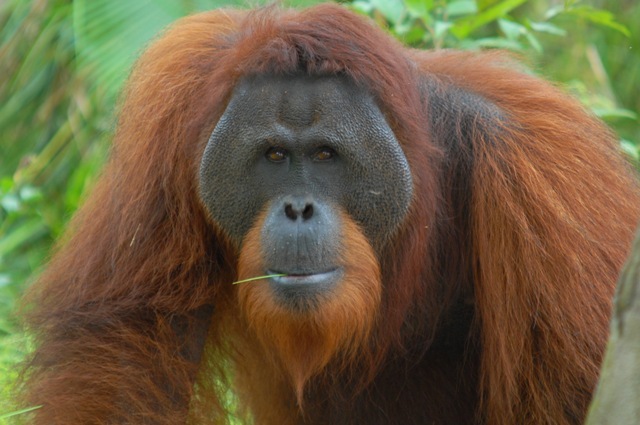 At 16 years old, Uban is a big adult male orangutan weighing a staggering 83 kg. Uban is dominant, active and prefers to be alone. With growing cheekpads, he is dashingly handsome. Tehang is a female orangutan who was confiscated from the community in Tehang village, Katingan Regency on May 9, 2003. 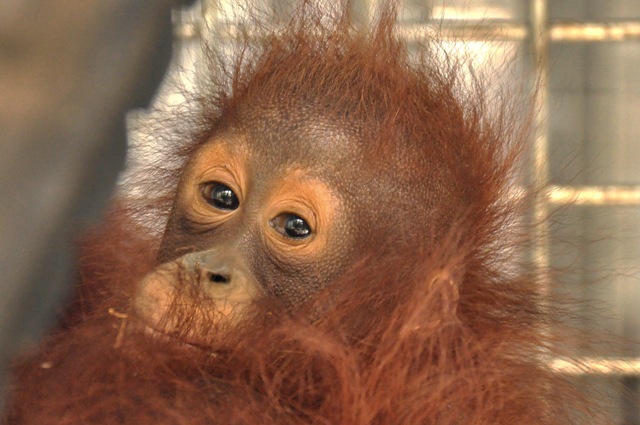 When she arrived at Nyaru Menteng, she was only 4 – 4.5 years old. 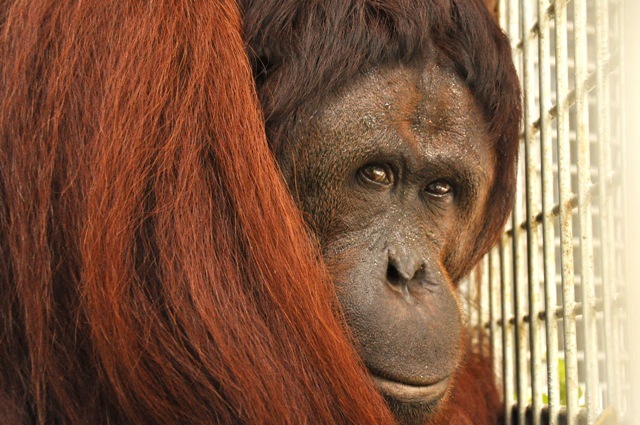 14 year-old Tehang is now a charming orangutan with an oval face, black skin and thick red brownish hair. She is independent and great explorer. 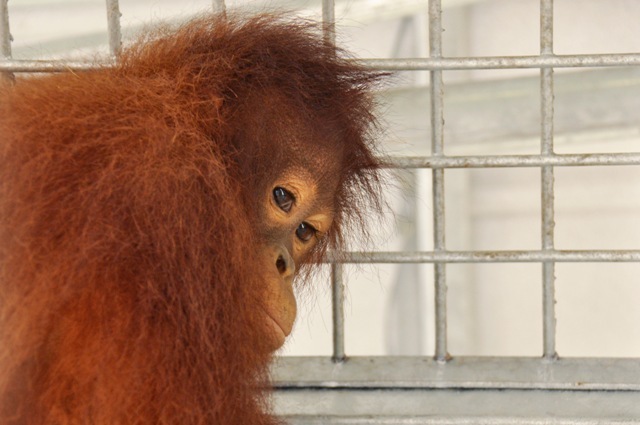 Matilda was confiscated from Palangka Raya at 3.5 – 4 years old, weighing 12 kg. On March 22, 2007 Matilda delivered her first daughter, named Astria. Matilda’s second daughter was born on January 19, 2012 and named Georgina. Matilda has brownish red hair and she is very active. She loves to explore and is so sociable. No wonder many male orangutans are attracted to her. Matilda’s tiny female baby Georgina of course is still always in her arms. Little Astria is an agile orangutan. With the skills she learns from her own mother, Matilda, she never hesitates to explore the forest all by herself. No wonder Astria looks like any other wild orangutan. 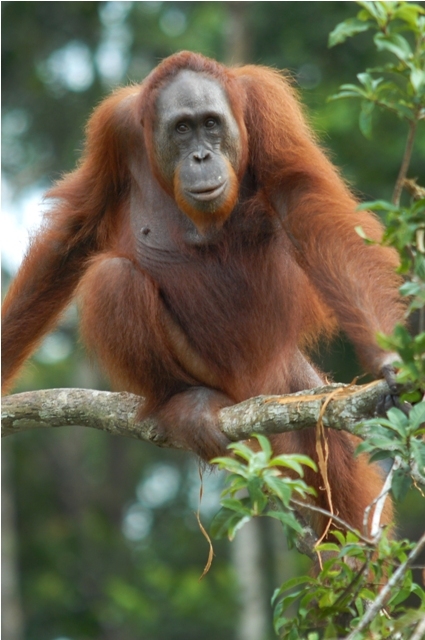 Now at 5 years old weighing 6.7 kg, the elegant female with brownish red hair is an active orangutan and doesn’t like being approached by humans. Despite her young age, her knowledge and skills such as nest-building are sufficient to live in a real forest. When Mita was confiscated from a resident of Palangka Raya, she was only around 3.5 – 4 years old and weighed 12 kg. Now at 17 years old weighing 28.9 kg, Mita has grown into an elegant and active female orangutan who loves to explore and is friendly towards other orangutans. Also confiscated from a Palangka Raya resident, Mongki was only 4 – 4.5 years old and weighed 17.5 kg, he then joined his peers in the Forest School. 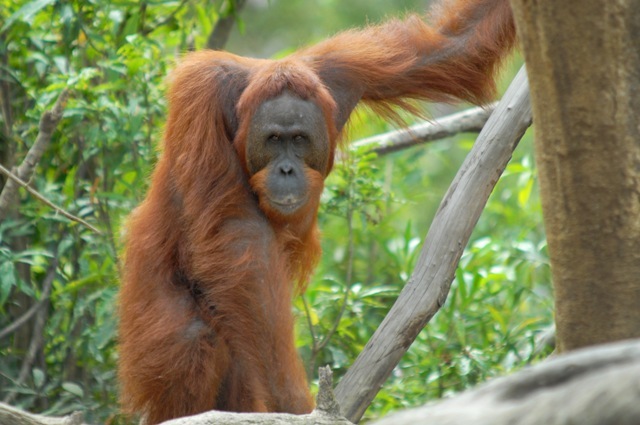 After he graduated from the Forest School, Mongki was moved to Palas Island. This sturdy male is now an active and dominant orangutan. At 16 years old and 39.8 kg, his cheekpads have started to grow, framing his handsome face. 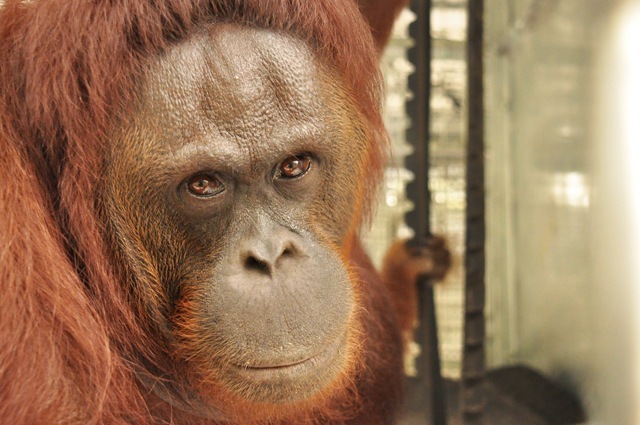 Confiscated in Jakarta, this female orangutan arrived in Nyaru Menteng at the age of 6 – 6.5 years old and weighed 18 kg. 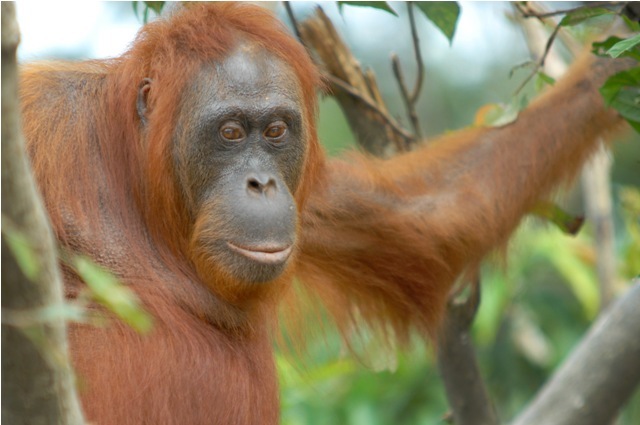 Nyaru Menteng’s founder, Lone Drøscher Nielsen named this beautiful orangutan with thick dark brown hair, Lona. 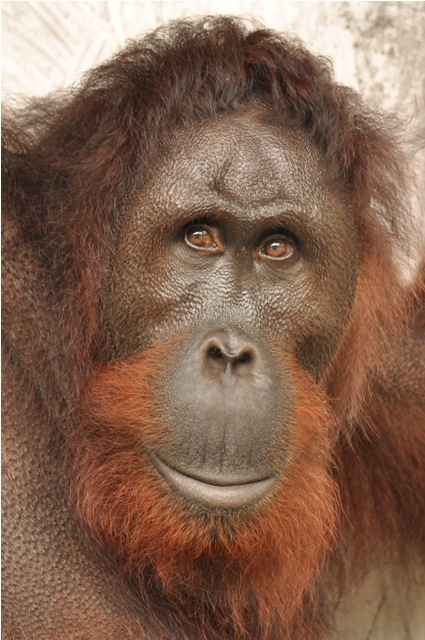 Living on Kaja Island since 2004, Lona socializes easily with other orangutans and loves to explore. On November 4, 2005, after one year on Kaja Island, Lona gave birth to a female baby named Nielsen, whom she loves and protects with all her heart. Lona is now 18 years old and weighs 35 kg. She is ready to return to her true home in Bukit Batikap Conservation Forest. Nielsen is now 7 years old and weighs 18.1 kg. Nielsen is a very active orangutan and does not like to be around humans. She has long and bright brown hair. Entering her teenage years, Nielsen is also ready to join her mother and her friends in Bukit Batikap Conservation Forest. Confiscated from a resident of Jakarta, Monmon was 4.5 – 5 years weighing 19 kg when she arrived at Nyaru Menteng. 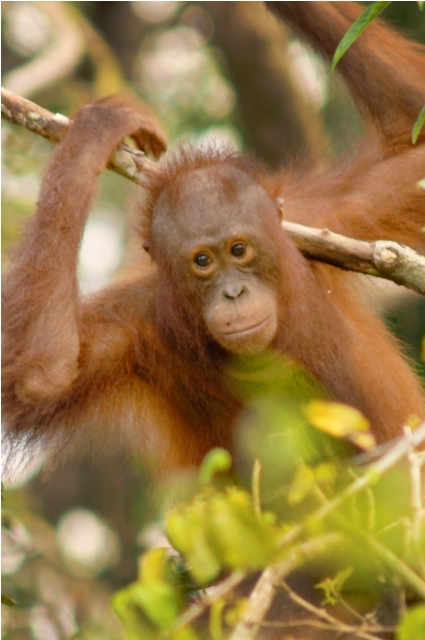 After finishing her study at Forest School, Monmon was placed on Bangamat Island, and later moved to Kaja Island. Monmon is now 13 years old and weighs 30.3 kg. The beautiful orangutan is ready to go home to the forest.